My husband Alan and I made the move from Queensland to Chiang Mai over a year ago. We’re trying out Thailand’s “Rose of The North” as a retirement destination and, as we’re discovering, one of the great things about living here is having the opportunity to explore this beautiful and exotic region. The city of Chiang Mai lies in the heart of northern Thailand. It’s rich in history and culture and offers a high standard of living at a low cost. And when you want to explore somewhere new, you’ll find yourself spoilt for choice. Top of our list was a town called Pai. Friends had told us about this former hippie hangout in Mae Hong Son—a mountainous, northern Thai province, that borders Burma—and we were keen to check it out for ourselves. 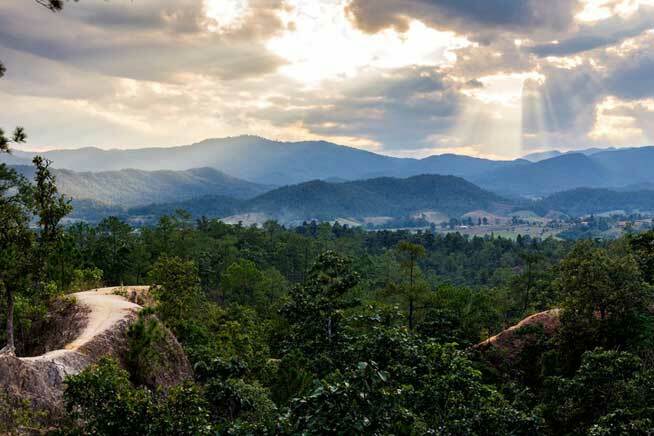 Pai is just over a three-hour drive from Chiang Mai and car hire costs $45 per day. We decided to take the bus, it costs as little as $7 per person and can be booked through one of the many small travel agents scattered around the city centre. On the day of our trip, we were picked up from our apartment and taken to our minivan for the journey to Pai. (You can also arrange a pick-up from a hotel or guest-house). Leaving the city behind, we made our way up into the mountains, passing small villages and roadside stalls, before winding our way through the 762 tight curves that led to our destination. The scenery along the way is beautiful, with glimpses of verdant valleys below, but the drive can make you queasy…the road is hugged by dense vegetation and sheer drops…so if you suffer from motion sickness, have your medication handy. Pai is a sleepy village on the banks of the Pai River but it’s a popular spot with in-the-know backpackers and grey nomads. The town is full of boutiques selling hippy clothing, travel agents selling tours and bike rental, massage and wellness centres, restaurants and bars. There’s also a nightly walking street market that sells arts, crafts and trinkets. Restaurants and food stalls line the street, tempting you to sample local delicacies. The jewel of Pai are the attractions. To explore these attractions, you will need to either hire a car, bike ($7 per day), or hire a white songthaew (a local bus with two bench seats). We chose to hire a white songthaew for the day which cost $18 and was split between four people. As we sped down country roads we waved to friendly farmers in the fields and admired the beauty of the landscape. We communed with nature at the Mo Paeng and Pam Bok waterfalls, relaxed and enjoyed the views at Coffee In Love—a roadside cafe with sweeping valley views, faced our fear of heights at Pai Canyon and worked on our cardio while taking in spectacular views as we stepped up to the brilliant white Buddha at Wat Phra That Mae Yen. We spent the night in Pai, staying at the Pai Do See Resort, where room rates for two are $33 per night. The first was a lookout with spectacular views of mountains that stretched out as far as the eye could see, it was breathtaking. Sitting back enjoying a coffee, I remember thinking that everybody should come and see this beautiful part of Thailand. We continued our journey, passing small villages with farmers working their fields, we soon came to the Tham Pla Namtok Pha Suea National Park. Tham Pla Namtok Pha Suea National Park is home to waterfalls, caves and borders Burman on the Northern and Western sides of the park. The main attraction is the Fish Cave, a small cave teaming with Soro Brook Carp. There is a Hindu shrine next to the cave to protect the fish as the locals believe they come from God. The park is beautiful, surrounded by mountains with shady walkways and streams. The rest rooms are clean and there are stalls selling refreshments. Our next stop was Phu Klon Country Club. The country club is set around a natural mud hot spring. The mineral rich mud is good for the skin and the hot spring’s therapeutic water is helps relieve stress and pain. I was pampered with mud mask facial which cost $3, and it left my skin feeling silky soft. Phu Klon Country Club as a range of different spa treatments to choose from. Arriving in Mae Hong Son we drove up the mountain to Wat Phra That Doi Kong Mu, a Buddhist temple. As I walked around the temple complex I was struck by the beauty of the tall white Chedi’s as the sun beamed down illuminating them against the deep blue sky making the gold decorations gleam. Temple dogs look down over Mae Hong Son, standing guard over this beautiful city and lake that is shielded by mountains. In the evening, we visited the Mae Hong Son Night Market. The market has a holiday atmosphere with vendors selling clothing, bags, jewellery and trinkets while food carts sell delicious treats. The market is set against Chong Kham Lake, the lights on the golden spires of Wat Chong Klang temple reflect across the water giving this city a magical feel. We only had one night in Mae Hong Son, staying at the Baan Rom Mai Resort. (Room rates for two from $34 per night).